Indie font family is a fascinating typeface designed by the Argentine designer Maximiliano Sproviero. It is another jewel in his very rich collection of magnificent typefaces. 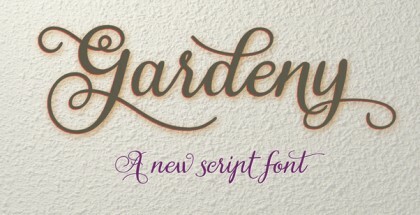 This time it is inspired by Carl Rohrs’ calligraphy and his unique brush-style. In fact, Indie font family is a demonstration of the wonders that could be achieved using a pointed brush and the limitless possibilities of the hand lettering. It has all fine features of this style as it is quite vivid and expressive and reminds us of how fast and turbulent the modern street life is. When speaking about that we must point out that this typeface, as the name suggests, is dedicated to the Indies and hipsters and the significant impact their work has on the modern graphic and type design. Overall, Indie font family is a great tribute to their lifestyle and as such will be perfect for any project that has something to do with the modern aspects of street life. Oh, and don’t forget to use it for fun. Pure fun! 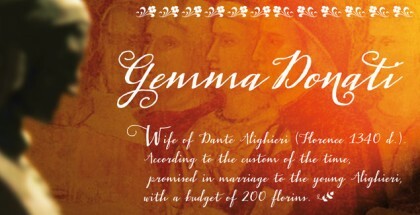 The most characteristic feature of Indie typeface is the five great styles that it is supplied in. 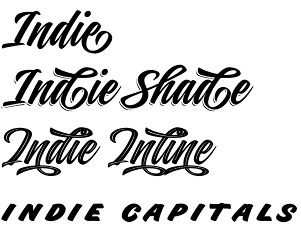 These are Indie, Indie Shade, Indie Shade Solo, Indie Inline and Indie Capitals. They are designed in such a manner as to perfectly replace and combine with each other. Every style has exactly the same glyphs and metrics as the others and all are OpenType programmed which makes their co-existence really outstanding. Get Indie font family and celebrate life!